Once again Parisians woke up on Sunday after a very rough night. Burnt cars, broken shop windows and rioters running through the streets were all they saw and heard. During the yellow vests protests yesterday in Paris, 133 people were left injured, including 23 members of the security forces. 412 rioters have been arrested, 378 of them remain in prison for the time being. Minister of Home Affairs Christophe Castaner does not exclude that the state of emergency is promulgated and the French army would come to patrol the streets, a situation not seen since the terrorist attacks of 2015. 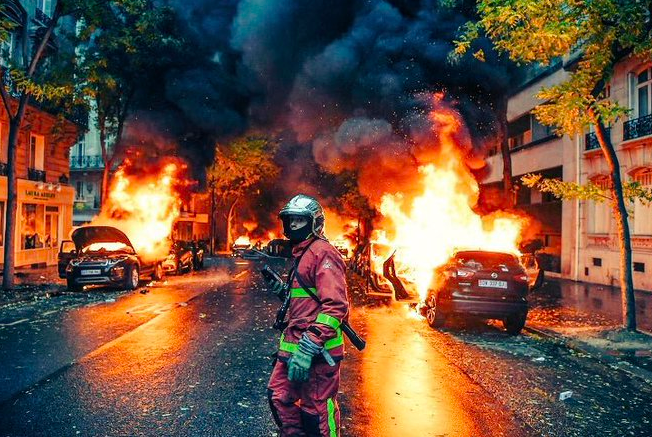 Related coverage: Paris Burns Again – Barricades, Riots, Rocks, Tear Gas, Rubber Bullets And Water Cannons (Video). The French capital was again shaken yesterday by "gilets jaunes" or yellow vests, who have been protesting for weeks against, among other things, the planned increase in excise duties on fuel. Rioters set cars on fire, pelted the police with yellow paint, plundered shops and conducted targeted vandalism to city property. French President Emmanuel Macron already condemned the violence: "I will never accept violence. Nothing justifies that French police forces are being attacked, shops are being looted, and passersby and journalists threatened and the Arc de Triomphe is being vandalized." Today Macron is meeting with the French government on how to handle the surging vandalism and rioting. The police unions propose that a state of emergency would be proclaimed in the French capital and Minister of Home Affairs Christophe Castaner does not exclude this happening. "I am willing to look at any solution that can ensure safety on the streets," says Mr Castaner. This should humble that half-a-sissy, Macron's, criticisms of the west. At the very least, we do not riot over oil/gas prices. I hope the French people take over their government and bring back the guillotine. How would the prime minister like it if he had to choose between fuel for his car or feeding his family. This fuel tax does not hurt him because he receives a big salary every month. If he brings out the military and they start killing civilians who will be left to pay his salary? They should make a new drama series on ITV for Sunday nights - "Paris Is Burning" instead of "London's Burning"
Viva La France! They’ve got that “tea party” feelin! Now if they just burn thise no go zones they’re back in business! I've heard on a couple of sites that the gas tax was the boiling point because of all the extra taxes on the French due to the influx of Illegal economic migrants. You wont hear this on MSM.. Replace the indigenous French population by importing millions of muslims. Create no-go-zones. Call anyone who complains a racist. Raise taxes. Expect an explosion. And the progressives wonder why!